Instead of a gingerbread house, make a peppermint stick house. Using icing (canned or homemade) to hold them together, stack peppermint stick “logs” on top of each other for the four walls. Position the four walls into a square, again using icing to hold the walls together at the corners to form the base of the “house.” Angle graham cracker squares and more icing to make the roof. Wait a few hours for the icing to dry, and use your icing glue to affix cookies or crackers on the house for doors and windows. Decorate the roof and the house with small candies and more icing glue. You can even make a small village of peppermint houses to display. Take a walk with your kids and gather a variety of items from nature like pinecones, acorns, leaves, and seed pods. Then, outside or in a well-ventilated room, cover the items with metallic spray paint. Sprinkle on some glitter or sequins if you’d like to add a little bling. 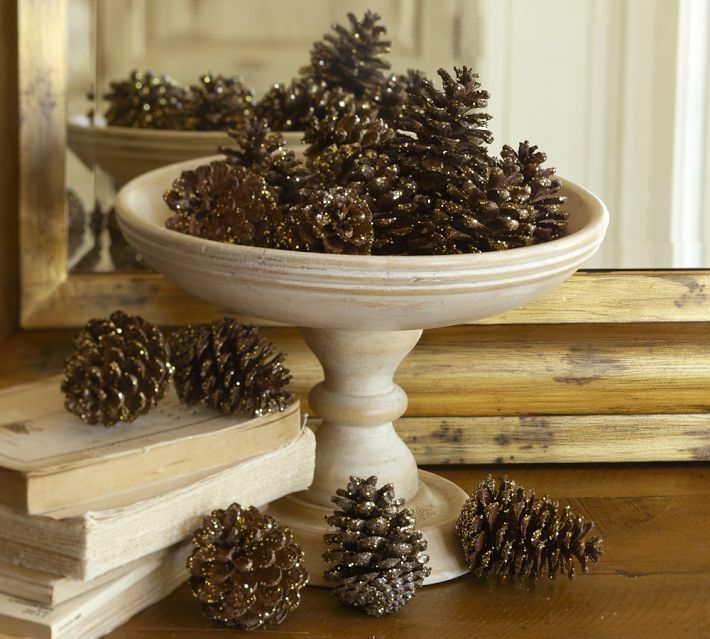 After the items have dried, you can affix strings or wires and use your bejeweled bits of nature as tree ornaments, in centerpieces, or displayed in bowls or tall glass vases or apothecary jars around your home. You could even follow these DIY wreath steps to create your own Christmas version using the above materials. Here’s an easy kids’ Christmas craft that helps teach the importance of recycling, too. Save the cardboard tubes from paper towels and toilet paper for this "Recycled Reindeer" project. First, cover the tubes with paper (leftover wrapping paper scraps are good for this step), then cut a triangle for the head and two smaller triangles for ears out of construction paper. Glue the heads onto the tops of the covered tubes, and use pipe cleaners or straws to make antlers. For the eyes and nose, you can glue on small candies, paper circles, or googly eyes and red pom poms that you’ve purchased at the craft store. Stand the reindeer up for decorations around the house, or incorporate them into your holiday table centerpiece. Don’t forget about old-fashioned kids’ Christmas crafts like colorful construction paper chains and stringing popcorn and cranberries. After all, these decorations became holiday traditions because they are easy, inexpensive, fun, and they stand the test of time.